Hearty oats, fresh apples, warm spices, baked till golden brown — this is the perfect breakfast on a cold winter morning. Combine oats, yogurt or kefir, maple syrup, and coconut oil in a bowl. Stir to combine and then cover with a lid, towel, or plastic wrap. Soak for 8 to 24 hours. Add eggs, cinnamon, ginger, nutmeg, clove, salt, vanilla extract, and baking soda. 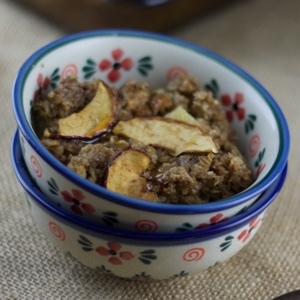 Decorate the top of the oatmeal with the thinly-sliced apple. Serve by itself, drizzled with maple syrup, or with milk poured over the top.